Sony and Fallon have finally released the much anticipated Sony Bravia paint advertisement online at www.bravia-advert.com/sony-bravia-paint. 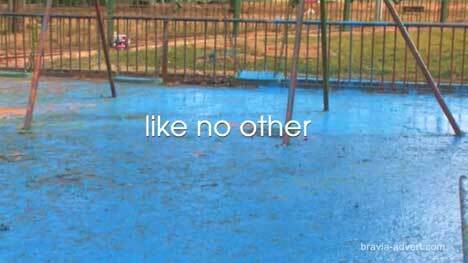 The ad begins with a drum roll and a series of blue paint explosion. 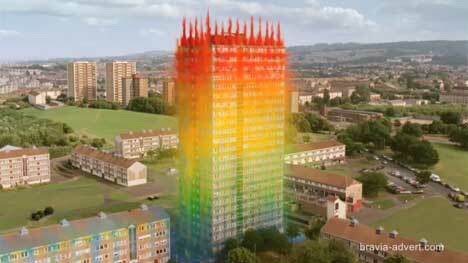 Plumes of colour shoot out from the ground in Glasgow’s Toryglen Estate. Two buildings explode in a plethora of colour, outside and inside. Columns of paint are thrown into the air where they burst like fireworks. The music pauses momentarily as a clown in a black and white suit and red shoes runs for it – towards or away from the paint? All of a sudden there’s a final frenzy of colour as a spectrum of colours is unleashed from the sides of the building. More geysers of paint erupt from the ground. Finally the explosions and the music end. There’s just the sound of falling paint. The final tagline: “Sony Bravia. Color Like No Other”. The Sony Bravia Paint Fireworks ad was developed at Fallon, London, whose team included group account partner Chris Willingham, executive creative director Richard Flintham, and creative director Juan Cabral, agency producers Nicky Barnes and Charlie Orr. Filming was directed by Jonathan Glazer at Academy Films, with producer Simon Cooper and director of photography Dan Landin. Apart from the challenge of working with a highly explosive set and pacifying the locals, the crew had to work within the confines of unpredictable Glasgow weather. David Patton, senior vice president of Sony Communications Europe, says, “It’s a unique idea, an iconic idea, and it’s never been done before. And there’s no doubt that it has scale”. Postproduction was done at Moving Pictures Company, with 3D supervisor Duncan McWilliam, and 3D VFX supervisor Jim Radford, 2D VFX supervisor Ludo Fealy, producer Graham Bird, coordinators Justin Brukman and Paula Da Costa. Colorist was Mark Gethin. A scale model of the Toryglen Estate was developed, including all firework and camera positions. Editing was done by Paul Watts at The Quarry, London. Music and sound were coordinated by Peter Raeburn at Soundtree Music, London. Music is from Rossini’s “Thieving Magpie”. 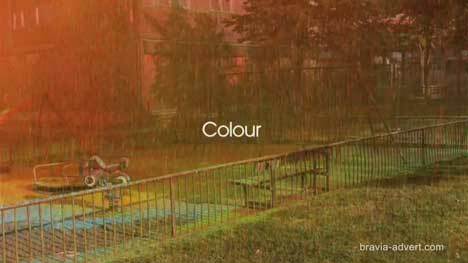 The full Bravia Paint ad (70 seconds) is available to view in high and low resolutions, and download in HD quality quicktime (35.9 mb), hi-res quicktime (14.9 mb), and low-res quicktime (4.81 mb). The Making of the Bravia Paint ad (5 minutes 18 seconds) (produced at Proudfoot TV) is also available to download at the Sony Bravia Paint web site. See my earlier post on the Sony Bravia Paint ad blog. Also my 2004 post on Jonathan Glazer. The 23-storey Queens Court in Crossbank Rd, Toryglen, was demolished yesterday by the Glasgow Housing Association. The tower block was built in 1968 for £600,000, to become a home for 132 families. Residents were moved out in May 2006 in anticipation of the block’s demolition.